Ireland fought back in the second half of the day to bowl Afghanistan out for 314, but lost captain William Porterfield early to finish Day Two of the Dehradun Test on 22-1 – trailing by 120 runs with nine second innings wickets in hand at the Rajiv Gandhi International Cricket Stadium. Batters Andy Balbirnie (14*) and Paul Stirling (8*) negotiated a tricky last 12 overs leaving Ireland with a challenging task, almost eerily similar to that which faced the side in their inaugural Test match at Malahide in 2018. Stuart Thompson (3-28) was the pick of the bowlers while Andy McBrine (2-77), James Cameron-Dow (2-94) and George Dockrell (2-63) took were among the wickets. 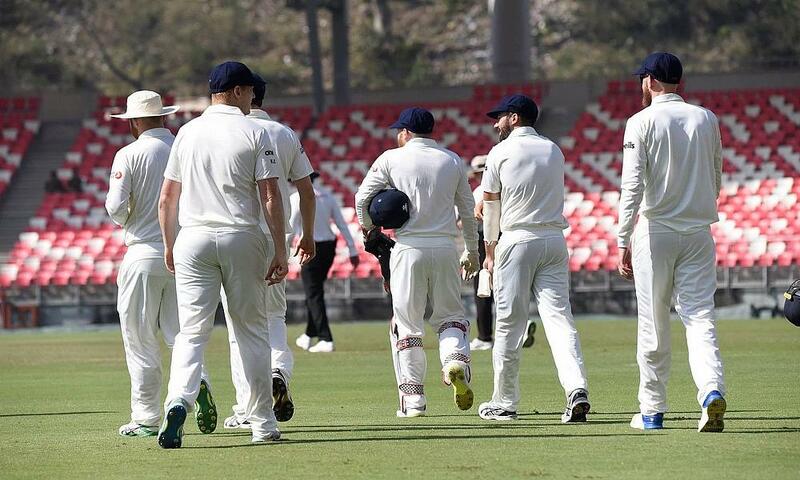 The Ireland bowlers were disciplined and didn't make scoring easy, but the morning was dictated by the Afghanistan batsmen, who displayed grit in stringing together valuable partnerships. A patient 98 from Rahmat Shah headlined Afghanistan's efforts, as they dug in to build a sizeable lead. His efforts were complemented by Hashmatullah Shahidi's fifty in a partnership of 130 before Asghar Afghan put on a display of power-hitting to secure a big lead for his side despite a flurry of wickets in the middle. Having begun the day at 90-2, Shah and Shahidi saw out the morning session – the first hour brought just 20 runs. The Irish bowlers extracted some purchase, and both batsmen faced a few nervy moments up front, but were able to put those past them and get on with the job of steadfastly building the innings. 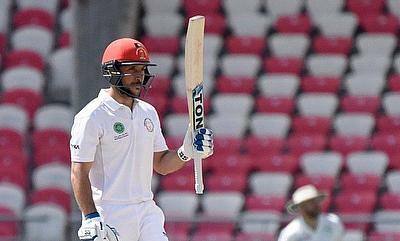 Shah got more comfortable as the day progressed, and even brought up his half-century – the first for Afghanistan in Test cricket – with a pull to deep mid-wicket off James Cameron-Dow. Shahidi followed suit some while later, bringing up the milestone with run-down to third man. Both he and Shah started to take more initiative once they went past the landmark. Attacking shots meant a better opportunity to pick up wickets and McBrine cashed in, tossing one up to lure Shahidi and trapping him in front for 61. Shah, at the other end, was cruising towards what could have been a historic century. But that dream was cut two runs short when he chopped one onto his stumps in looking to run Tim Murtagh down to Third Man. It was a painful moment for the batsman after having got so close to etching his name in history, but it was due reward for Murtagh, who went about his job with excellent dedication, only rarely straying from his areas. 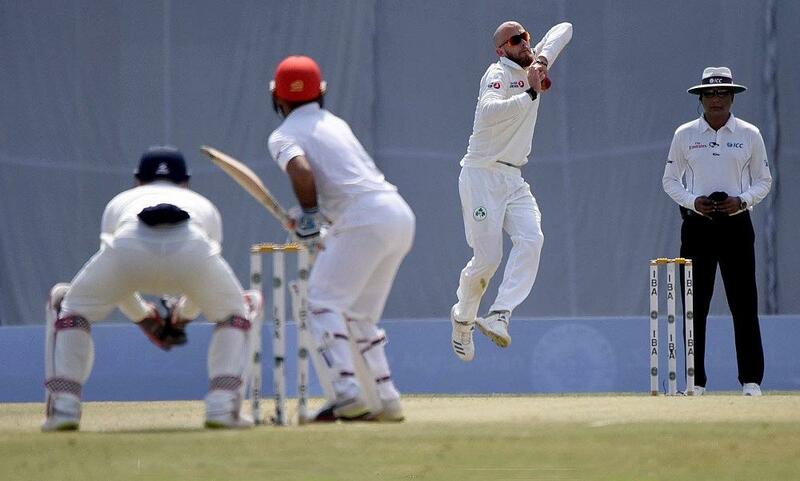 One brought two as Thompson had Mohammad Nabi caught at mid-wicket for a duck. It was a leg-stump half-volley, but Ireland had earned their luck. The bowlers continued to make inroads. Ikram Ali Khil's 50-ball vigil for seven runs was ended with a dipping off-break from McBrine, which went through his gate. Rashid Khan came out with counter-attacking intent, and struck a six and four off Dockrell but the bowler had the last laugh, trapping him in front with one that went on with the angle. Another arm ball from Dockrell accounted for Yamin Ahmadzai. Afghan was holding fort at the other end. His intent became increasingly attacking as wickets fell at the other end. In the over after Ahmadzai was dismissed, he cleared the deep mid-wicket fence before going over the straight boundary to McBrine's bowling. The second six brought up his fifty. Thompson brought the innings to an end, getting him to nick one to the wicket-keeper, then went on to wrap up the innings in his next over, capping the lead at under 150. A difficult task though became a little harder for Ireland when skipper Porterfield edged one behind the stumps on the second ball of the innings, from Ahmadzai. WATCH: ?? Stuart Thompson on his 3/28. 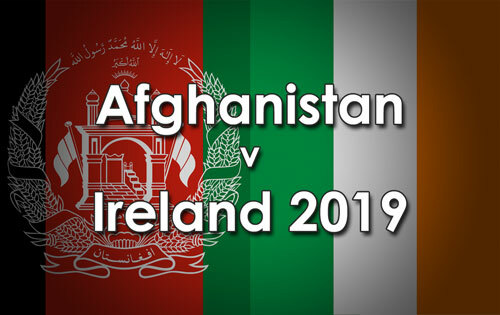 #AFGvIRE #BackingGreen?? "It was good early on when I got into a bit of rhythm and had a good long spell. It was hard work out there, as the wicket didn't offer us very much, but we knew if we kept going with tight lines and good lengths we’d get our rewards eventually." "[Today] was all about keeping their runs down - we didn't score enough in the first innings, to be honest and we were about keeping their run rate down and then going bang, bang with the wickets." "There's still three days to play in this Test, and a lot of time to bat. If we can put on some big partnerships - the two lads tonight looked set - so if they can kick on and we bat for a long time then we can go past them and get a big lead."